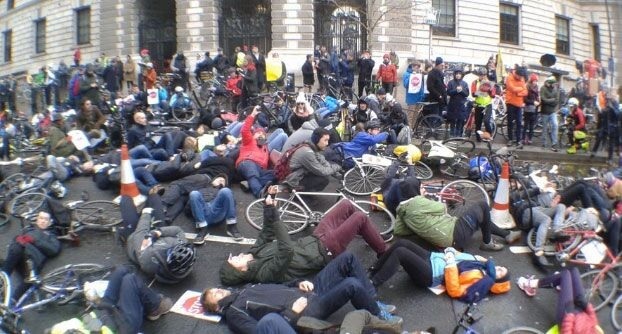 On Saturday (11 Feb), hundreds of cyclists wheeled their cycles down Whitehall to the Treasury, before staging a ‘die in’, which involves protestors lying down on the street as if they had been knocked off their bicycle. The protest, organised by ‘Stop Killing Cyclists’, also featured children wearing gas masks in front of the treasury to symbolise the ‘thousands’ of UK children whose lungs are being ‘stunted’ from living on polluted streets or attending polluted schools. Stop Killing Cyclists says that cycling and walking are ‘crucial’ to creating a healthy and sustainable UK, adding that successive Governments have ‘lethally underfunded’ active travel. In a post on the group’s website, it says current spending plans would further reduce the cycling budget to less than £1 per person in England, compared with the Dutch investment of about £24 per person per year. The group is urging the Government to ‘radically increase’ funding for cycling and walking to 5% of the 2017 transport budget, and to 10% by 2020. Stop Killing Cyclists was set up after six cyclists were killed in London in November 2013, to carry out ‘direct action in protest against traffic violence’. The group has organised a series of die-ins, the most high-profile of which took place outside the DfT in April 2016. In the last ten days, five people – three cyclists and two pedestrians – died on London’s streets. In 2016, nine cyclists were killed on the Capital’s roads. Donnachadh McCarthy, co-founder of Stop Killing Cyclists, told the BBC: “We have had enough of the breadcrumbs – we need real spending. In the lead up to the event, Caspar Hughes, spokesperson for the group, said: “Air pollution is poisoning millions of people in the UK, whilst traffic carbon emissions are contributing to the climate emergency. 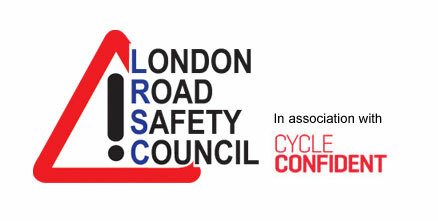 Road danger means most people do not feel safe cycling on UK roads, which means they lack life-saving physical exercise. Photo: Stop Killing Cyclists via Twitter.